The 11th Annual Summit was held on June 25th, 2014. The summit pairs investors with entrepreneurs who can bring innovative products and services for the longevity economy to market. InnovateLTC is located in Louisville, Kentucky, which has the largest cluster of aging care headquarters in the world. Over $50 billion in revenue reaches all 50 states, delivering care from companies like Humana, Kindred, Signature HealthCARE, Almost Family, Atria Senior Living, Pharmerica, and Trilogy Senior Living. "Bikanta is pleased to have had the opportunity to present at the Boomer Venture Summit. 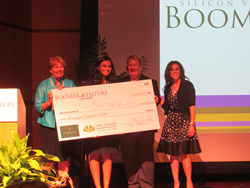 The business plan competition was the icing on the cake!” said Ambika Bumb, PhD, Founder and CEO of Bikanta. “We were thrilled to share our technology and passion for nanomedicine. Nanodiamonds extend the potential for researchers to ask questions at the molecular level, and in the long run empower the clinician to address disease at the cellular level. We plan to use the prize money towards educational materials that describe the power of nanodiamonds and nanomedicine." Judges for the Business Plan Competition included: Brian L. Clark, UnitedHealthcare; Dean Hoang, Pinnacle Ventures; Jody Holtzman, AARP; John Hopper, Link-Age Ventures; Tom Rodgers, Cambia Health; Scott Smith, Viant Group; and Gavin Teo, Comcast Ventures. About Mary Furlong and Associates Founded in 2003, Mary Furlong & Associates (MFA) is headquartered in San Francisco. The firm's strategy, business development, marketing and public relations services are uniquely geared to drive new opportunities for clients in the baby boomer and senior markets. MFA has secured more than $130 million for longevity marketplace investments, and more than $15 million for non-profits. Dr. Furlong is the Dean's Executive Professor of Entrepreneurship at the Leavey School of Business at Santa Clara University and founder of SeniorNet (1986), Third Age Media (1996), and Mary Furlong and Associates (2002). For more information, visit http://www.maryfurlong.com.